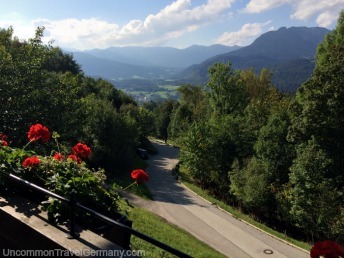 Berchtesgaden Germany: what to see and do in this alpine gem! 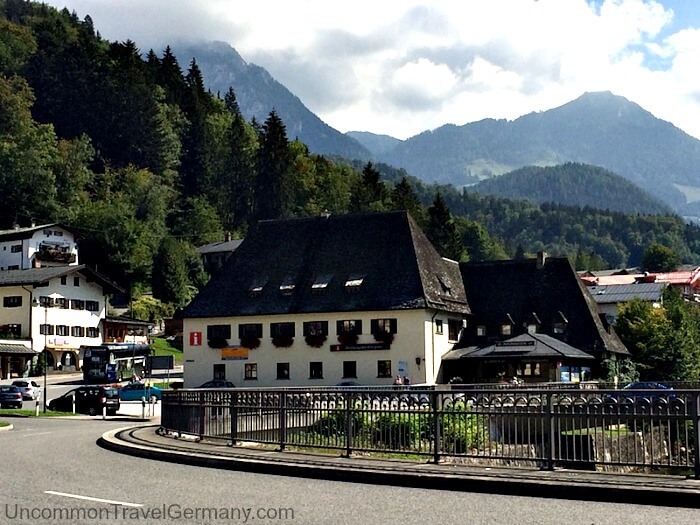 The picture-book village of Berchtesgaden, Germany, is full of tourists and almost too cute, but so what! The alpine setting is gorgeous and the history is fascinating, so it's definitely worth the trip. Berchtesgaden, Germany, is a village of 7,000, tucked against the sheer walls of the Bavarian Alps. The town sits in an area called the Berchtesgadener Land, a pocket of alpine terrain surrounded on three sides by Austria. The best thing to "see" here is really just to enjoy the charming, mountain-village ambiance. Stroll through the winding streets lined with pastel buildings decorated with "Luftmalerei" paintings, browse the wood carvings and Bavarian clothes in the shops, and stop at one of the many cafes with outdoor seating to enjoy Bavarian specialties and beer, or Kaffee und Kuchen (pastries). This area is very popular with tourists (over 2 million visit every year!) so it is not exactly off the beaten track. Expect to see lots of people in the cafes and browsing the shops. However, the crowds mainly show up in the afternoon and evening, so mornings are a good time to explore the town. Most of the people seem to be concentrated within a block of the Markt (central market place) even at the busy times, so it's easy to escape. I still think it's worth it, and there are vast natural areas to explore in the truly beautiful surroundings (see things to do in the Berchtesgaden area). And if you have an interest in WW2 history, this is a truly fascinating location to investigate. Later in the day, some local musicians may play brass band music in the Markt, while folks have dinner or relax around the fountain. Once a week (Mondays, when I was there), a local band plays selections of traditional and classical music on the stage in the town square. 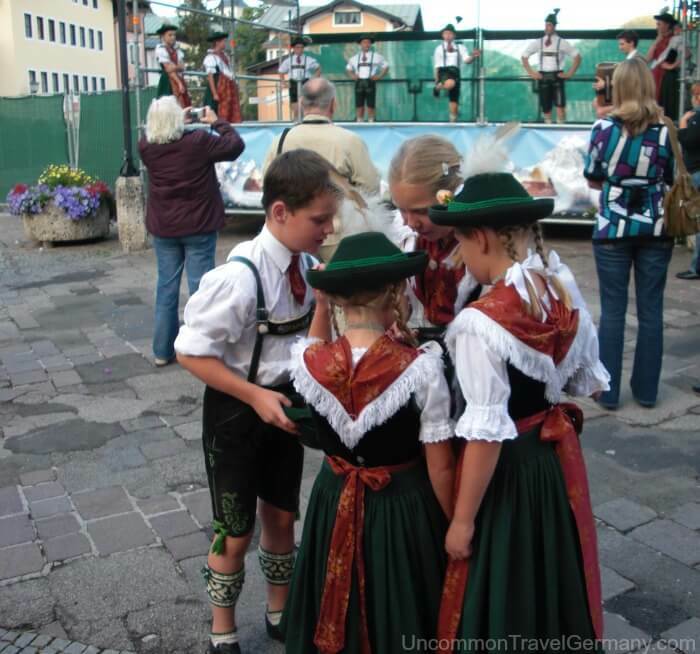 The highlight is a group of children in Bavarian costume, or Tracht, performing folk dances for the spectators- touristy, but charming. Local children in Bavarian "Tracht"
Just beyond the Markt is the Schlossplatz, an open area in front of the pink royal residence of the Wittelsbach family, who ruled the Berchtesgadener Land for many centuries. The church attached to it, the Stiftkirche, was built in the 12th century, and some of the medieval portions and cloisters still remain. Both the palace (Schloss) and the church are open to the public. Along one side of the Schlossplatz is an arcade with some shops, and an interesting mural illustrating the tragedy of war, showing young men in Wehrmacht uniform saying goodbye to their families. If you're in the mood for a gemütlich Bavarian beer hall experience, try out the Hofbräuhaus Berchtesgaden, at Bräustrasse 15, for wurst and local beer; the brewery has existed since 1645. 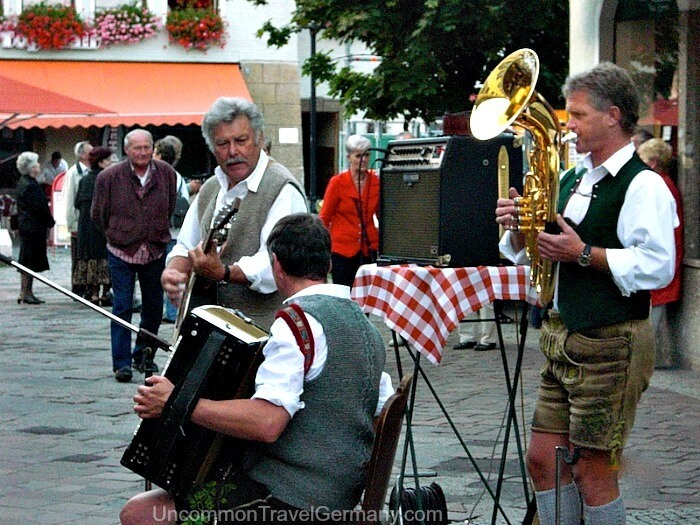 On Saturday nights in the summer, there is a show with Bavarian music and dancing. Shopping. The local crafts are on display in the shops along the pedestrian zone leading to the Markt: wood carvings, religious and non, painted wooden boxes, and Bavarian tracht- beautifully-made dirndls and lederhosen, which the Bavarians still wear. Salt was the basis of this region's wealth for centuries. Mining began in 1193 and the mine at the edge of town started operating in 1517. If you've never been inside a salt mine, I'd highly recommend going on this tour; it's fun and educational. The tour takes you deep inside the mountain into the tunnels, riding in a little train. After getting into a miner's coveralls, you slide down a couple of wooden slides the miners used (or walk down) and sail across an eerie underground lake on a raft (a cross between Phantom of the Opera and the Mines of Moria!). All ages are allowed, so it's not strenuous. Salt mine tours are given daily, year round, from 9 to 5 (11 to 3, Nov-Apr); allow about 2 hours. 14.90 Euros for adults, 9.50 Euros for children, 3 and under free. Check out their website for current info, www.salzbergwerk.de/en. Tip: if you have a Tages-Ticket (Day Ticket) for the buses, you get a 10% discount on the salt mine tour. See day tickets for more info. The mine is on the main highway, B305, (or Bahnhofstrasse, which becomes Bergwerkstrasse) that runs past the town along the river, about a 17 minute walk from town, or a short bus ride (from town or the train station. Easiest way: take bus #848 from the bus station in front of the Hauptbahnhof. See map at bottom of page. If you're staying in Salzburg, there's a half-day tour to Berchtesgaden that takes you through some beautiful mountain scenery to Berchtesgaden for a visit to the salt mine. After touring the mine, there's a brief tour of Berchtesgaden, then back to Salzburg. See salt mine tour for more info and booking. 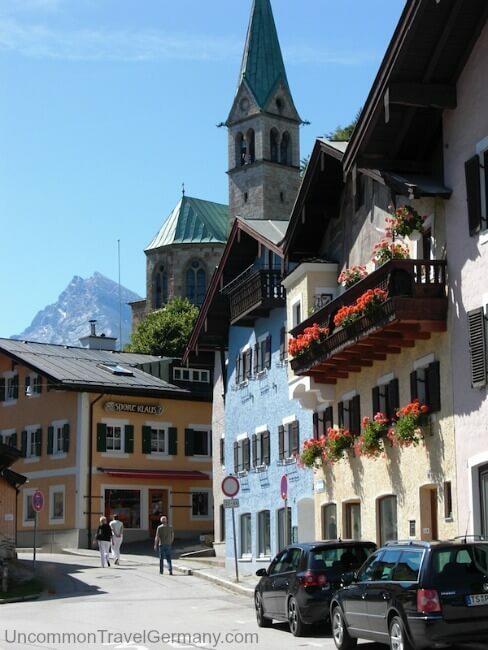 For recommendations on local accommodations, in the town or the surrounding area, see Berchtesgaden hotels. For a special treat, travel back to the 1940's and stay at the Hotel zum Türken, up on the Obersalzberg! This was, of course, well-known as the alpine HQ for the rulers of the Third Reich. If you're interested in seeing the Dokumentation Center, an extensive museum about the rise of National Socialism, and explore the bunkers and locations associated with the history of that period, you can go up to the Obersalzberg, a ten-minute drive or bus ride above the town. That's also the spot where you catch the bus for Hitler's Eagle's Nest, well worth the effort. This area is blessed with numerous walking trails and crystal-clear mountain lakes like the Königssee, Obersee and Hintersee. Hopefully you'll have some time to explore nearby areas while you're here. The Tourist Information Office across from the Berchtesgaden train station can supply you with maps of the hiking trails. And Salzburg, Austria, is only 12 miles, or 20 km, away (as the crow flies). 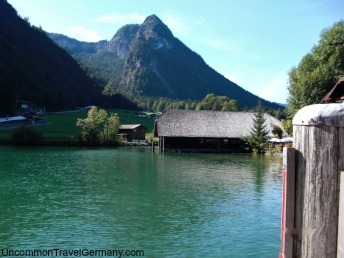 For suggestions, see day trips from Berchtesgaden. 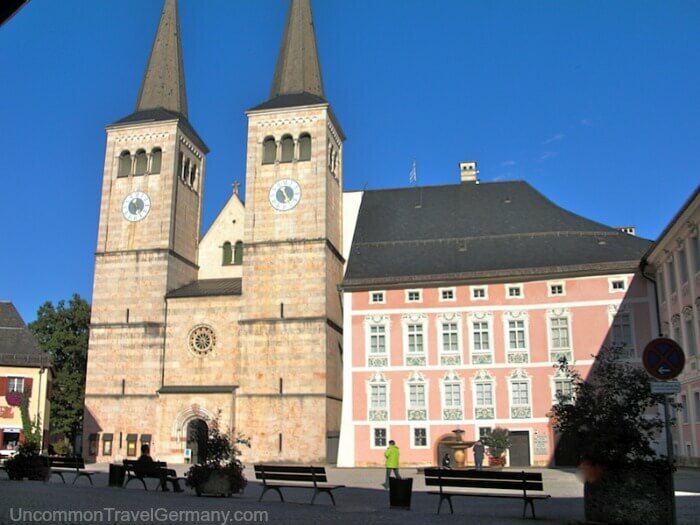 For the scoop on getting around the Berchtesgaden area on buses, plus saving money on bus tickets and attraction fees, see my tips on taking buses in Berchtesgaden. If you are arriving in Berchtesgaden by train, you'll discover the train station is not really in the central town area Berchtesgaden. The town itself sits on a hill above the station. The easiest way to get up to the town is by bus or taxi (if you have luggage you don't want to carry, or physical limitations). Local buses run frequently from in front of the station and there are taxis available 24 hours a day. 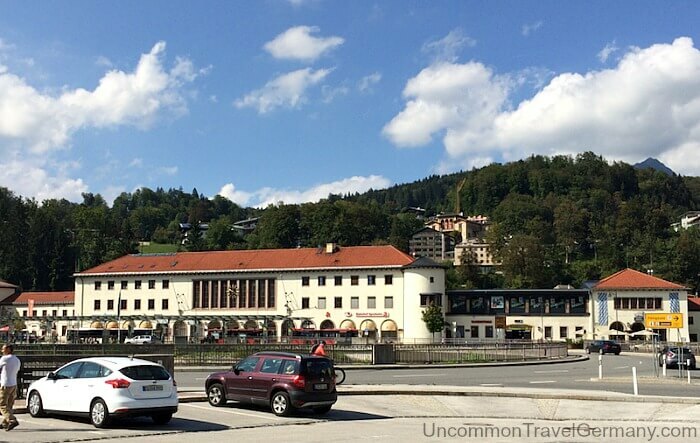 Bus #839 goes from the Bahnhof up to the town; get off at the Berchtesgaden Zentrum stop for the town center, or further stops, depending on where your hotel is. It's only a 10 minute walk (via the short cut) to the town, but it's up a steep hill; still, it's OK with a rolling suitcase or a backpack, though part of the route isn't paved. Going along the main road outside the station (Bahnhofstrasse), and then up to the town, takes twice as long. 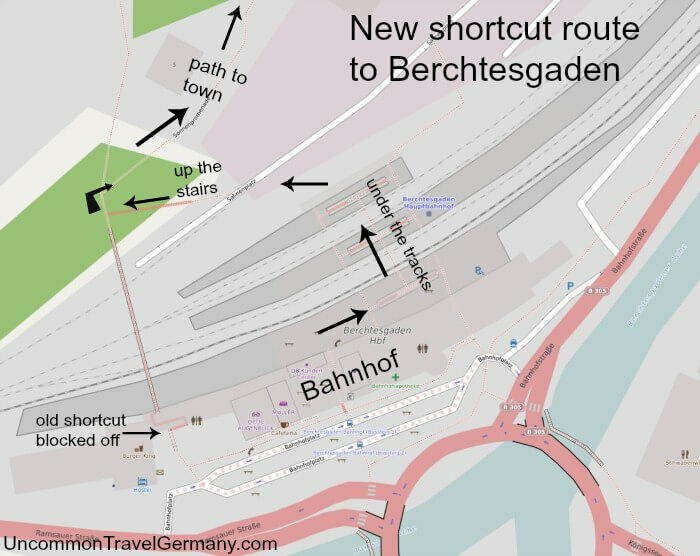 The short cut's route is not easy to see when you arrive at the station. 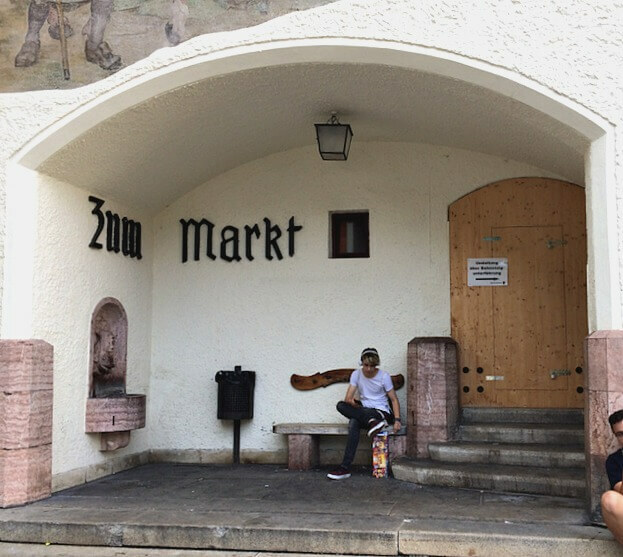 It's no longer via the doorway with the sign "Zum Markt" painted on the wall. Now, just go down under the train tracks via the underground passage, all the way to the other side of the tracks. When you come up, you'll see a site with lots of building materials on your right. Go left (there are small signs, but not very noticeable) and go up the long, metal stairway. Turn right and take the path farthest to the right. 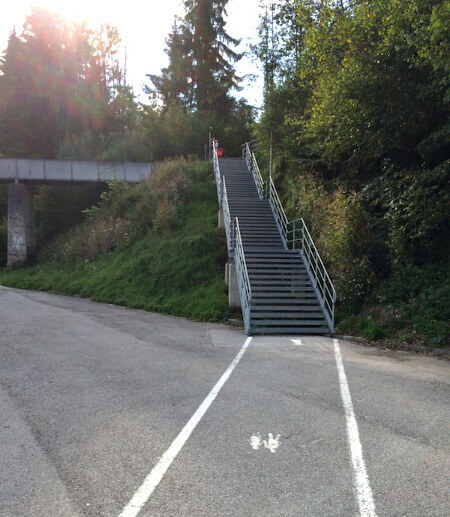 This path will take you up to the main street in Berchtesgaden (Maximillianstrasse). 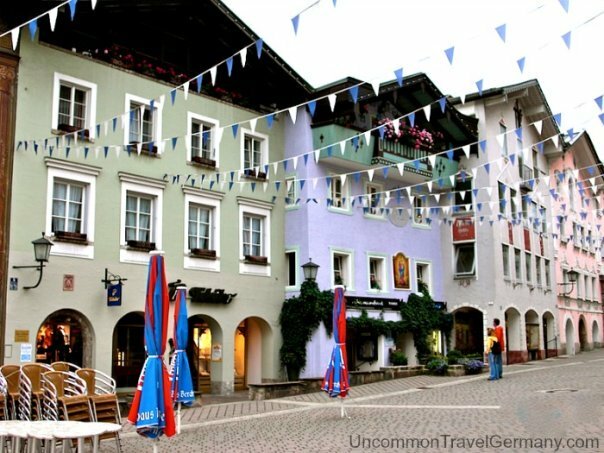 Go right again on that street and the road will take you to the center of Berchtesgaden. If you're arriving by train, before you head up to the town, cross the street to the Tourist Information Center to collect bus schedules and brochures on the activities you might be interested in. 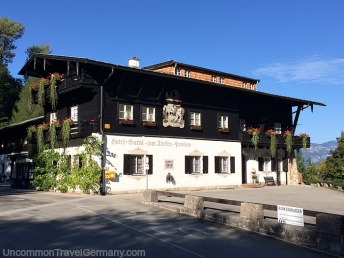 The office for the Eagle's Nest Historical Tours is in this building as well, and you can make reservations for that tour there - an excellent way to see the Obersalzberg and Eagle's Nest. 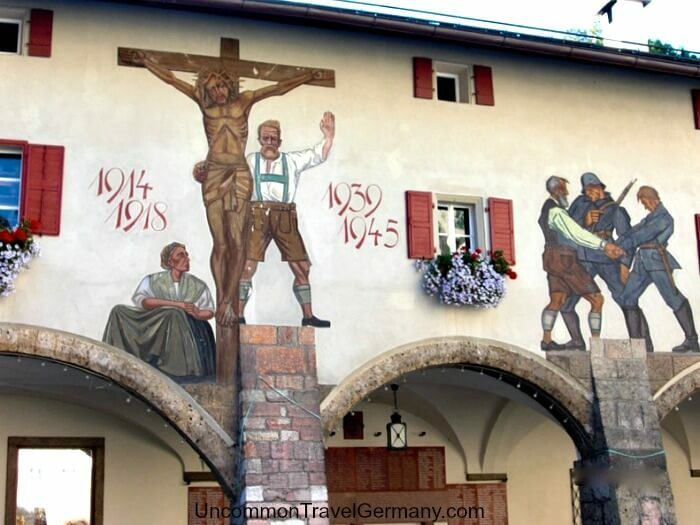 There is another Tourist Info Center up in the town, but if you need to find a hotel, I think it's easier to book it before you head up there, in case you decide to stay on the Obersalzberg, or in a hotel or family guest house near the town. Also, the center across from the station covers the whole area, not just the town. If you don't have hotel reservations, the staff (who speak English) at the Tourist Center can help you find something suitable and make the calls for you. Or if your German is pretty good, you can use the bulletin board out front, with photos of an assortment of family guesthouses and a free phone to call them with. David Harper, who conducts the Eagles Nest Tours with his wife Christine, has written a really useful and interesting guidebook just about Berchtesgaden. I have found the major guidebooks to be very sketchy in their info about this area, even the Rough Guide, which usually has more detail. David has lived there since 1986 and has put together a guide full of information about the history, local customs, activities, hiking, shopping, do-it-yourself tours, etc. I ordered it from him online before I went there and found it very helpful, but I believe you could also get it from him in their office located in the Tourist Center. You can order it through his website, Eagle's Nest Historical Tours. Berchtesgaden was used as a hunting domain by local aristocrats (from the Salzburg area) starting in the 11th century. Though this region had been considered too rugged to live in earlier, in 1122 some Augustinian monks founded a church and college in what is now the town. Settlers then arrived to work the land owned by the church; the people farming the land were serfs and serfdom didn't completely end here until 1807. Salt mining started here in 1190 and other industries arose around the same time, wood-carving, toy-making and dairy cattle, which are still practiced today. As a result, the town became prosperous. Berchtesgaden was an independent principality under the Holy Roman Emperor for centuries, and became part of the Kingdom of Bavaria in 1810. The monastery built by the Augustinians was remodeled into a palace and used as the king's residence from 1818 on. Napoleon's army looted Salzburg, but spared Berchtesgaden, in 1803 because the prince was an old school chum of the French general in charge. When King Ludwig III of Bavaria was forced to abdicate in 1918, he fled to Berchtesgaden. 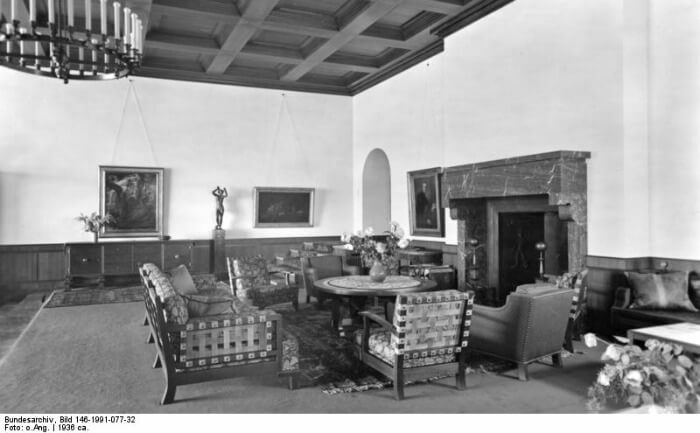 His son Rupprecht lived here in the Schloss until 1933, when Hitler became Chancellor; the prince fled to Switzerland, but returned after the war and lived in the palace until 1953. Adolf Hitler came to live nearby in 1923, after he was released from prison following the unsuccessful Munich Putsch. Hitler chose Berchtesgaden, or rather the Obersalzberg, the hill above the town, as his country residence. He rebuilt his mountain cottage into a large, alpine-style mansion he called the Berghof, and spent more time here than at his official residence in the Berlin Reich Chancellery. This home was the scene for much of the political and military planning during the Third Reich and the Führer received numerous foreign dignitaries here, including the Duke and Duchess of Windsor, Benito Mussolini, and British Prime Ministers Neville Chamberlain and David Lloyd George. Martin Bormann, Hermann Goering and Alpert Speer also built homes on the Obersalzberg, and Himmler had one nearby in Schönau (formerly Sigmund Freud's house). 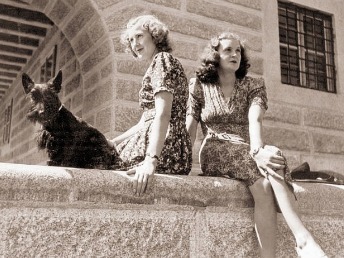 Eva Braun spent most of her time at the Berghof. The Eagle's Nest, sitting high above the town on the top of Hoher Göll peak, was built as a present for Hitler's 50th birthday. 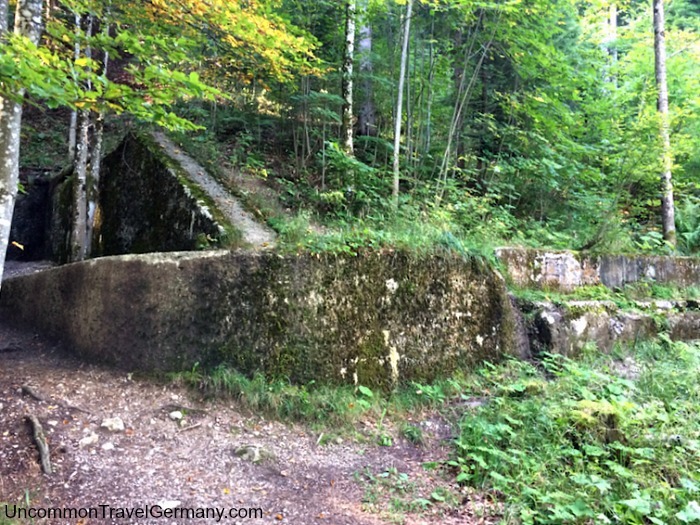 This area was also used as a major R & R area for German soldiers during the war. Many of the important guests stayed at the Berchtesgadener Hof Hotel in town; unfortunately, this building was torn down a few years ago and a museum is being built on the site. Hitler's Berghof was damaged in the bombing raid on April 25, 1945, and the ruined building was blown up in 1952. Nothing remains now but parts of the foundation wall (located next door to the Hotel zum Turken). 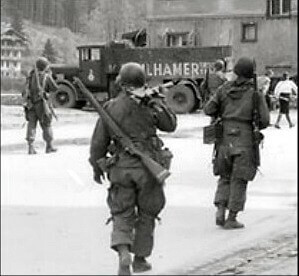 American soldiers arrived in the town on May 4, 1945; after the war, the U.S. Army used various hotels in the area as low-cost resorts for its service members. The buildings were returned to the government of Bavaria in 1995. The vast size of the Hauptbahnhof is due to an enlargement of the existing station done in 1937 to accommodate Hitler and visiting VIP's. The building is characteristic of the monumental style of National Socialism period. Hitler arrived by train via the northern end of the station (on the right, facing the station, where the three yellow awnings are), which now houses a travel agency. His Mercedes would then take him up to the Berghof on the Obersalzberg, 10 minutes away. A second major enlargement was done recently; everything to the right of the round tower was just added. Paula Hitler, Adolf's sister, is buried in a graveyard in the town (the Bergfriedhof on Obershcönauerstrasse outside of town). She lived here after the war and died in 1960. Her grave marker was taken down in 2005. Hermann Goering had left the Obersalzberg before the bombing, and surrendered to the Allied Forces on May 7, 1945, just over the border in Austria; he had used the tunnel behind the train station to hide his art collection. It's easy to get here by train from Munich, with a change in Freilassing. The trip takes about 3 hours. By car, take the autobahn A8 south of Munich into Austria, then A10 south to highway B305, which runs right past the town. Berchtesgaden is only about 20 km from Salzburg. You can go by train to Freilassing and change (Euro 8.80 and takes one hour and 15 minutes), but it's faster (45 minutes) to take a bus. Bus #840 (The Watzmann Express) leaves just about hourly from several stops in Salzburg, including the Hauptbahnhof and the Salzburg Rathaus, and drops you at the Berchtesgaden Hauptbahnhof. See Deutschebahn for bus and train schedules, plus all the #840 bus stops in Salzburg. You can buy your ticket online, in the station, or on the bus. The Tages-Ticket. For 10.40 Euros, you can get a day ticket that pays for the train or bus from Salzburg to Berchtesgaden, and also gives you unlimited travel on the local Berchtesgaden area buses. It's good for bus travel to nearby attractions like the Obersalzberg, Ramsau, Lake Königssee, and Lake Hintersee. The ticket also gives you discounts on a number of local attractions. See Berchtesgaden travel tips for more info on this ticket plus other useful tickets. The center of town is pedestrian only. There is an underground parking garage near the town center, on Maximillianstrasse, near the Old Cemetery (Alte Friedhof). There are also a couple of parking lots several blocks from the center of town, or you can park at the Salt Mine lot on the B305 highway outside of town and take the shuttle bus.